Want your changes to last? Look in the refrigerator! A few weeks into the new year, people are trying valiantly to keep their resolutions. Some even look to others as accountability partners or coaches. Those types of people can make a huge difference in our lives. However, individual commitment is the most important key to success. 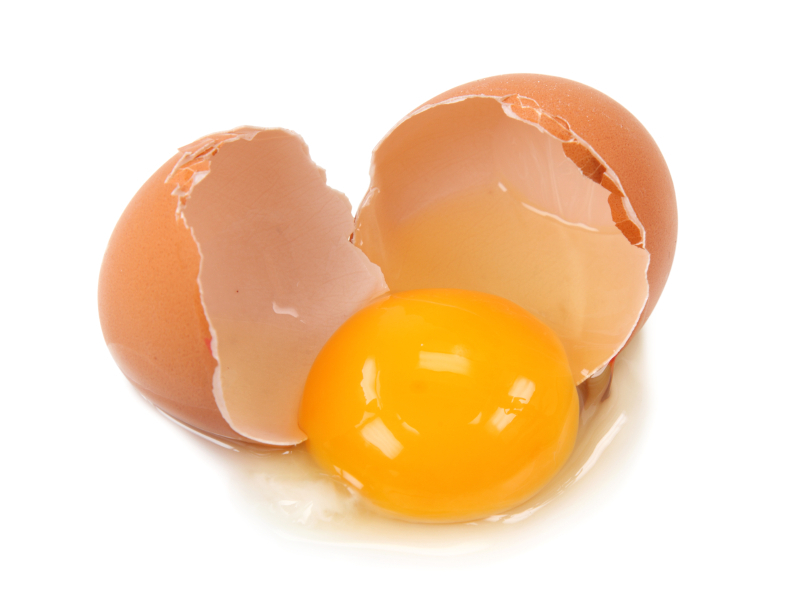 Let’s take a look at our friend, the egg. 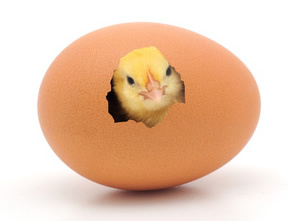 So, when you want to see yourself make a change or help others, remember, the big changes in life start from the inside! 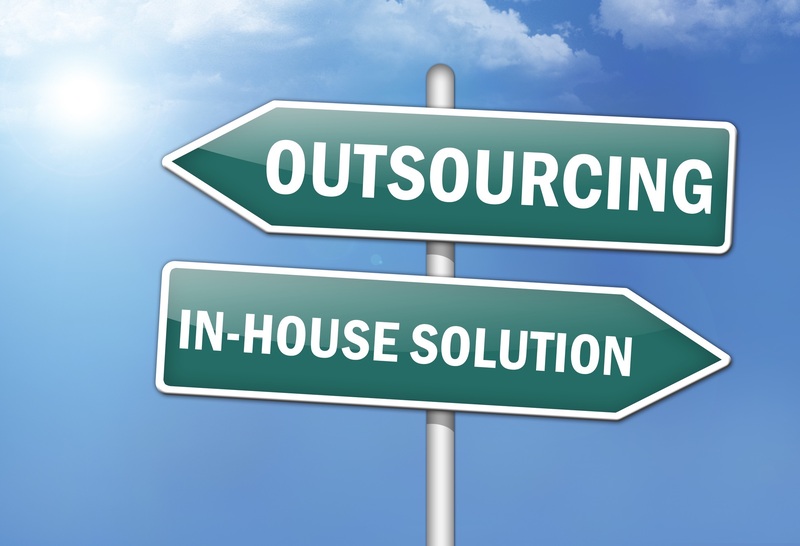 After seeing the results of several rounds of outsourcing, it’s clear that a successful outsourcing requires a significant investment by both the outsourcer and the company. Often, the company that is outsourcing their system or organization underestimates the amount of work needed to kick off and maintain the relationship. This leads to frustration that the outsourcer “just doesn’t get it” when, in fact, they aren’t getting paid to be mind readers! That analogy came to mind recently when I tried to outsource part of the journey to manhood of my two sons. I didn’t approach it intentionally, in fact, it took a couple of years before I realized what I was doing. It helped that my wife stayed close enough to the situation so I didn’t shoot myself in the foot! I spent my childhood and most of my young adult years in a Christian scouting organization. When my older son was old enough to join, we went to a local church that offered the same program (even though it wasn’t ours). He never seemed to love the program like I did and his younger brother wasn’t a fan either so we went ‘shopping’ for a better option…or should I say a better outsourcer. We looked at several alternatives and ended up participating in a group at our local YMCA called Adventure Guides. After the first event, all I did was complain that it didn’t meet my (unexpressed and not well understood) expectations. I was guilty of many of the same errors first time outsourcers make and I didn’t even know I was in the market! I’ve come to the realization that I need to be the main supplier of experiences on my sons’ journey if I want to ensure that they arrive when and where I think they should. If I want to entrust that responsibility to anyone else, I’ll need to be almost as involved as I would be if I did it myself. And it makes me wonder, what other areas of my life am I unintentionally outsourcing. How about you? Are there any areas in your life that you’ve been unintentionally outsourcing? Let’s talk about what you can do to be more engaged there in the comments section below! As a father, I want to raise my sons in Hero Training School whether they realize it or not. I certainly hope that my actions and words have an impact on the man, husband, and father they want to be. But, at the same time, if I want them to be ready when called upon, they need hero practice. 1) Unplanned events – those teachable moments when you help them understand that making fun of others is not acceptable or how to be patient when learning a new skill (like tying their shoes). My biggest enemy to success in unplanned events is just that…they’re unplanned. I’m a big planner. Most days in my life have a high level plan (go here, do this, etc.) and those plans don’t usually include taking an extra five minutes before we leave to review (insert your choice of skill or character quality here). Those 5 minute delays don’t have an earth-shattering impact on my plan but they just might on my kids. 2) Planned events – times when you know the activity is going to be hard but you intentionally schedule it. It could be anything from learning to ride a bike to rock climbing. It doesn’t even have to be something you have personally mastered. 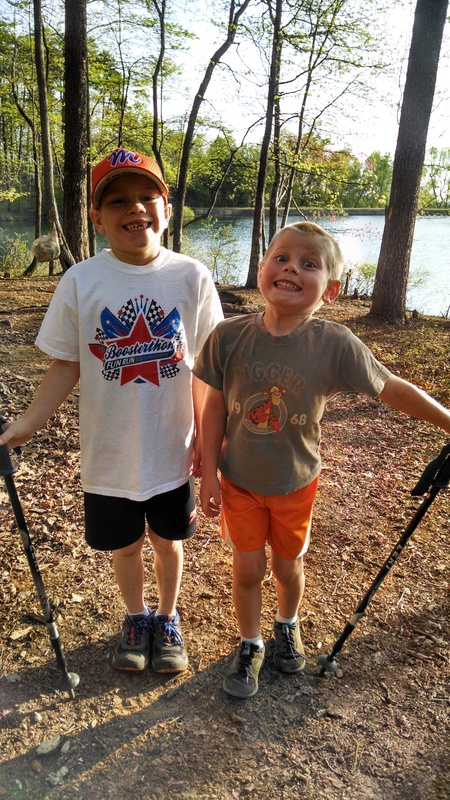 I know one dad who learned to kayak with his son…showing that Dad doesn’t have it all figured out either. The challenge to these events is planning them. Can you sacrifice one Saturday of errands or one week night of personal time to help your child accomplish something? It’s all about intentionality. I’m making a commitment to join ‘Hero Training School’ as an intentional instructor not a reluctant replacement. How about you? 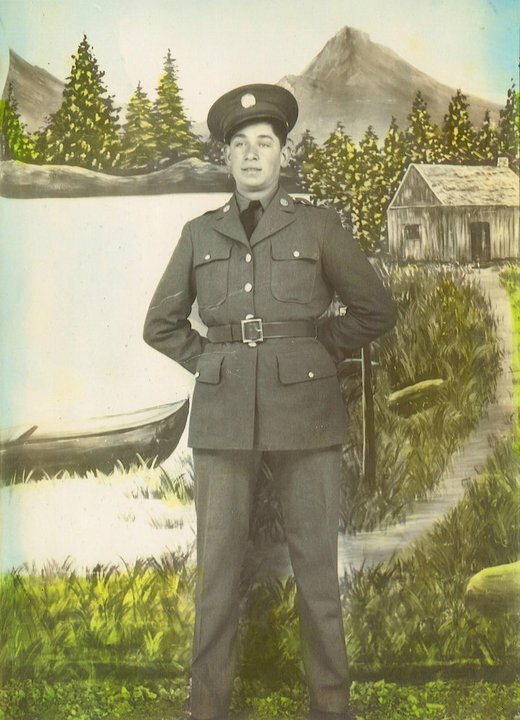 I recently wrote about how I had the opportunity to attend Hero Training School as a result of my father’s example which was influenced by his father’s example. For several reasons, I need to take a minute to recognize my mother’s contribution to my ‘Hero Training School’ experience as well. Why? How does a mother contribute to her son’s ‘Hero Training School’? One big thing she can do is to let him know how special he is. My Mom has been a personal cheerleader through life. 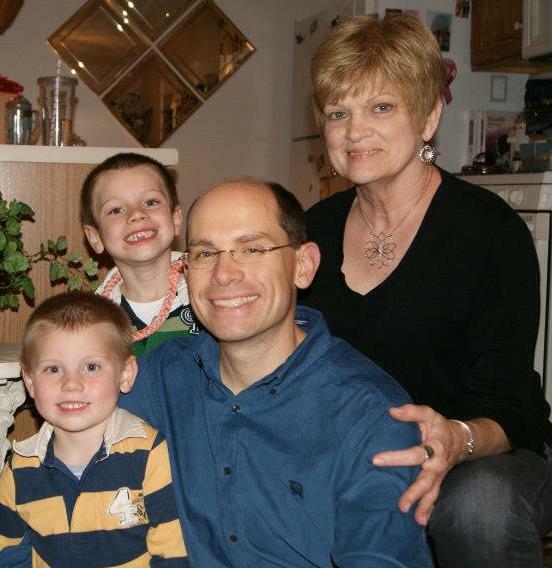 Through choices and changes, she’s stayed amazingly positive (even if us moving to France soon after having the first grandchild was hard for her to take…). I see my wife taking the same cheerleader role for our sons. She constantly reminds our older son that he’s ‘strong, smart, and studly’, even as he assures us that he feels anything but that. Moms, don’t forget that your children (sons especially) need someone to support them throughout life’s changes. My grandfather, Frank E. Fields landed on D-Day, June 6 1944, at Utah Beach in Normandy. He died before I was born and therefore has always been a ‘mythical’ figure for me. He did some pretty heroic things as a soldier in the 4th Infantry Division, earning the Purple Heart and Bronze Star. 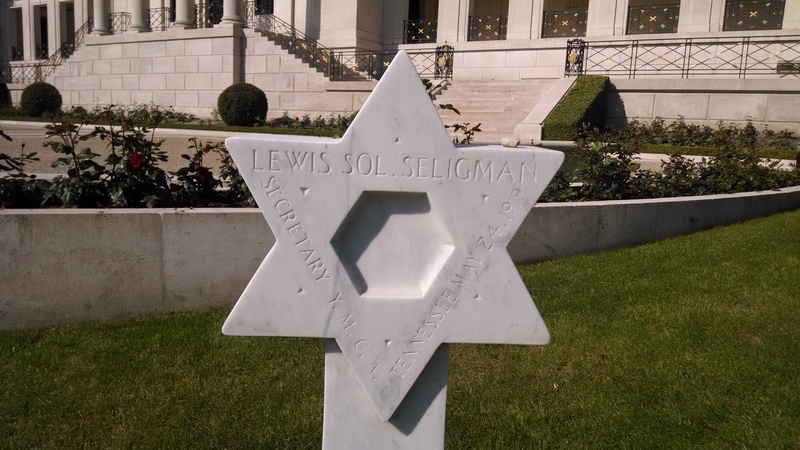 Family lore has it that he was even recommended for the Medal of Honor. I realized that, although, I had never met Frank, I had most assuredly met his son (my father), Jim. And I knew a LOT about Jim! How patient he was when his son forgot the tent stakes forcing them to spend the night in a boat on an island in the Clinch River. In fact, in observing Frank, Jim had spent 22 years in ‘Hero Training School’…and I’m fortunate to be spending my 39th year observing my Dad. As a kid, he was certainly my hero. Classic teenager attitude plus my parents divorce led to a period where I was sure that he was my ‘anti-hero’ but a loving wife and fatherhood has made Dad’s heroism much more clear to me. So, parents, how about you? You’re a hero to your kids whether you feel that way or not. In fact, your kids are in ‘Hero Training School’ right now. One day both you (and they) will wake up to see how similar you are. Will they be thankful for that similarity or despise it? During my (currently frequent) travels, my family (well, at least one son) likes to see pictures of the things that I’m doing/visiting. I usually try to post 2 or 3 pictures at the end of the day on facebook along with a creative sentence or two. 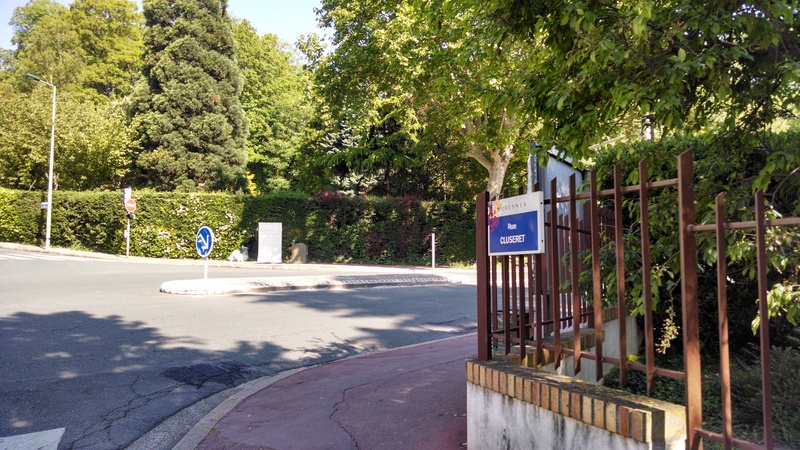 For a recent visit to the French Air and Space museum, a facebook post was more than enough. However, it would be a great disservice to the place I visited today if I thought a pithy sentence (or two) would suffice. 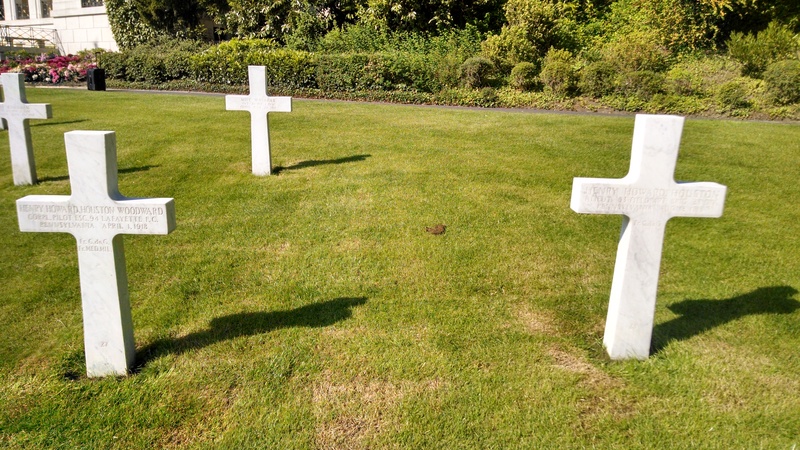 Suresens American Cemetery is the final resting place of 1541 Americans that died during the First World War and the place of rememberence for another 974 whose bodies were lost at sea. 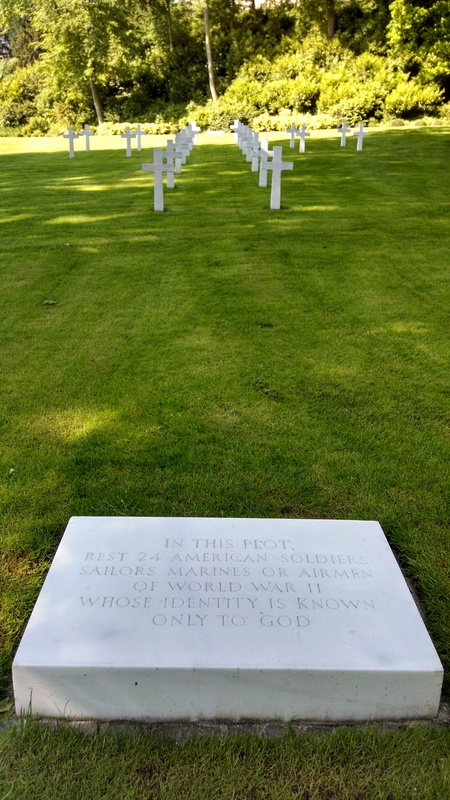 In addition, 24 soldiers “known but to God” from the Second World War are buried there. 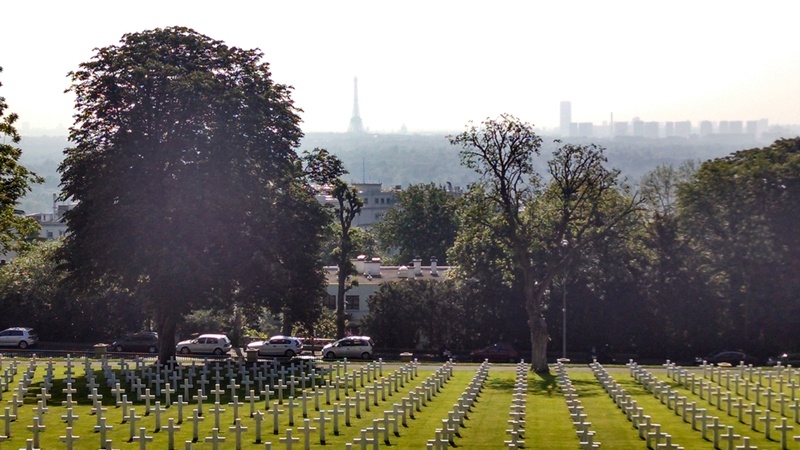 The cemetery is on a beautiful hill overlooking Paris. Despite my many visits to Paris since 2003, I hadn’t yet visited. So, on this weekend between work meetings, I decided to find it. . I tried on Saturday but, unfortunately, I left later than planned and I didn’t realize that there were two ways to get there from my hotel…the 1.5h way and the 25 min way. Sunday morning was as beautiful as Saturday so I left my hotel planning to arrive between 9 and 10 (most overseas American cemeteries are open 9-5 , 363 days per year) . I got there around 9:40 and apparently surprised the receptionist as she hurried to put on her lipstick as I walked in the door of the visitors center. I had read on the Internet that this cemetery was not visited often and I would have to agree. I saw no one during my almost hour there and just a few names in the visitors log from the past few days. 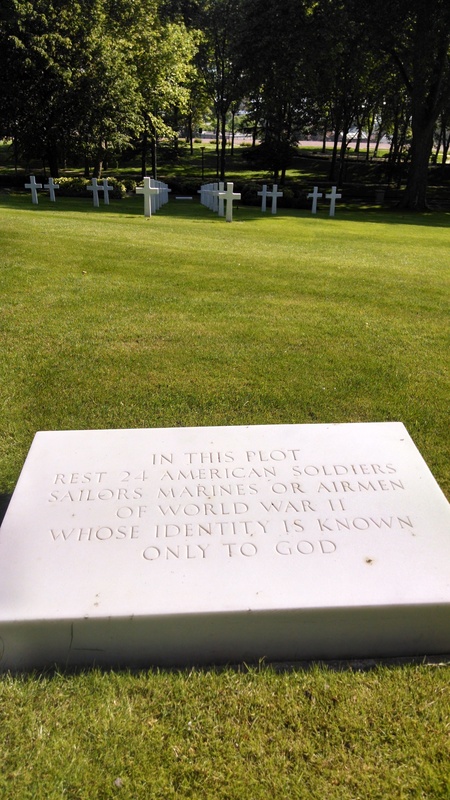 When I visit these sacred plots of American soil in Europe, I feel personally obligated to walk in front of each grave and say the person’s name aloud (even though I’ve never had/taken the time). 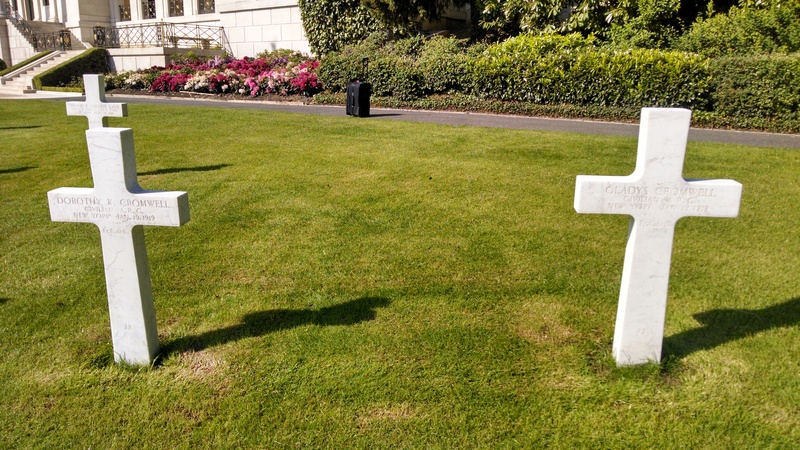 I guess I believe that a small act of remembrance shows my appreciation and that the person didn’t die in vain…Europe and the United States are still free because of their sacrifice. 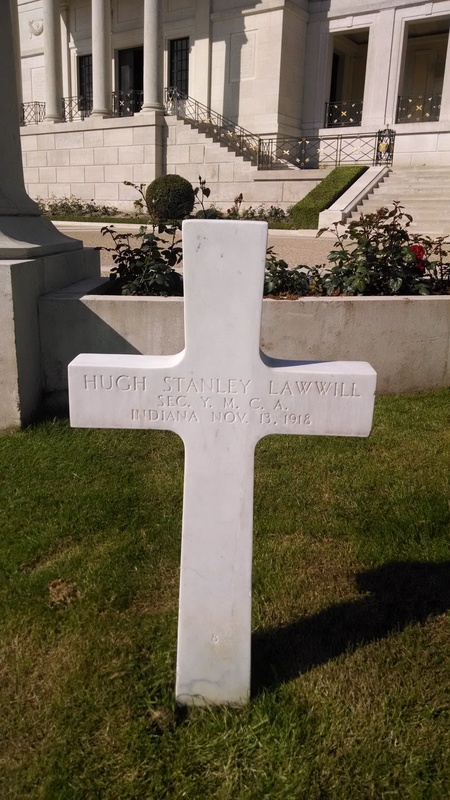 Henry Howard Houston Woodward who flew with the Lafayette Flying Corps and was decorated by the French government is interred beside Henry Howard Houston. I can’t find any indication they were related. until I walked down the hill and saw it from another perspective. A cross made of 24 crosses. This may sound strange but this is at least the second time I’ve been at a cemetery and, just as I got ready to take a picture, the flag unfurled. 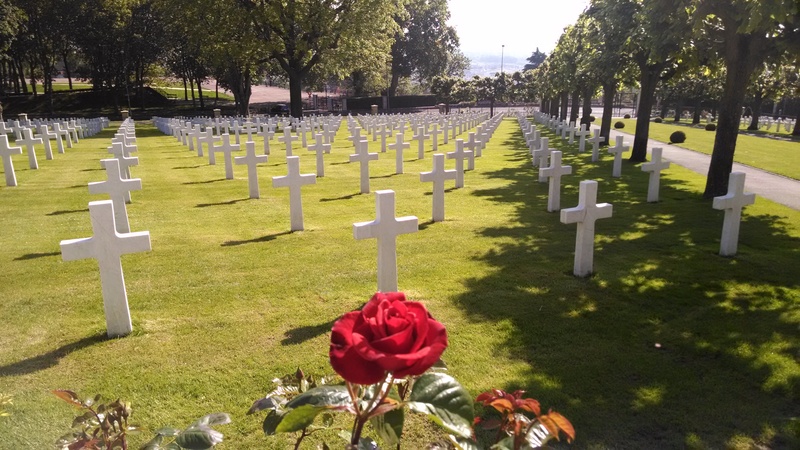 The number of Americans killed in the First World War seems huge until you realize that, in the Second World War, over 360,000 FROM JUST ONE COUNTRY lost their lives. One estimate I saw was that 60 MILLION people died worldwide (2.5% of the world’s population). That’s just staggering. In Paris and want to go? Get on the T2 line (if you’re in downtown Paris, take Metro line 1 to La Defense, then look for the T2 signs. Note that you’ll need a ticket that is slightly more expensive than your classic Metro ticket (mine was 2.65 Euros I believe). 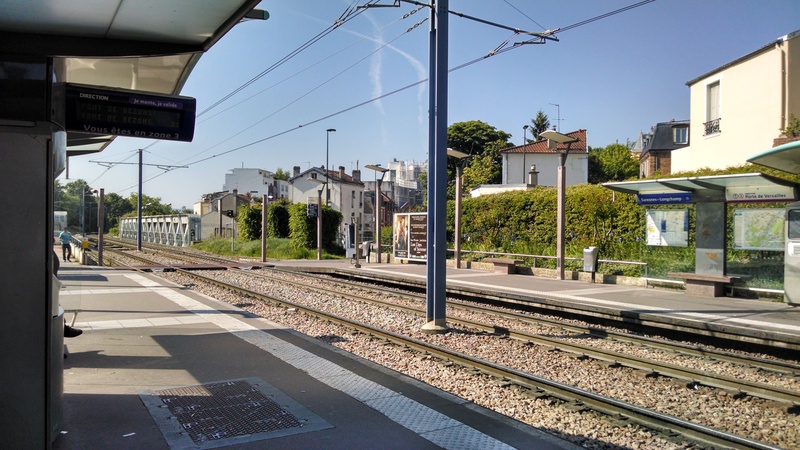 Take T2 in the direction of Pont de Versailles and get off at Suresnes-Longchamp. Take a left off the train and then your first right. Get on Rue CLUSERET (note, it’s shaped like a curvy lightning bolt) and hike to the top of the hill. If nothing else, the hill will make you appreciate the terrain! When you get to this sign, you take a right and in about 2 minutes walk, the cemetery will be on your left. Almost there, just take a right here! 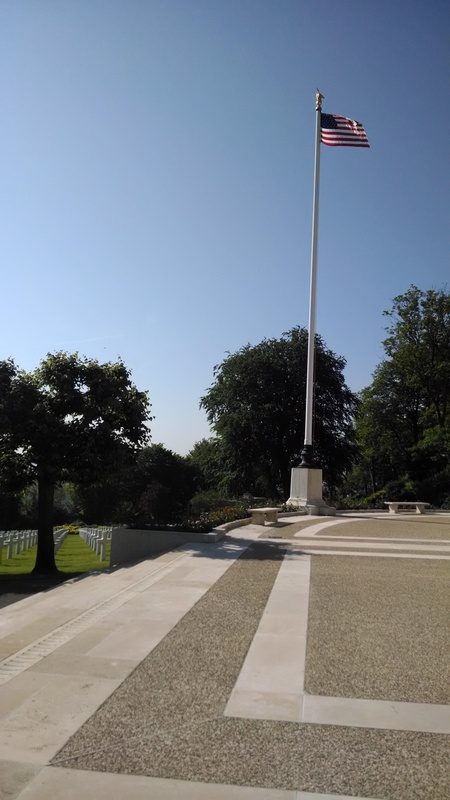 …a view that you can take in thanks to the American soldiers, sailors, airmen, and nurses who rest peacefully here. Recently, I’ve been writing about heroism. We often identify with them because we see in them the character qualities that we would like to see in ourselves. Little boys who dream of being a fire fighter and little girls who dream of being a ‘mama’ are just reflecting their desire to be like those who seem heroic to them. However, as we get older, unless forced, we don’t do much that seems heroic to us. That can cause people (especially men) to compensate by identifying with those who seem ‘more’ heroic (i.e. professional athletes and teams). 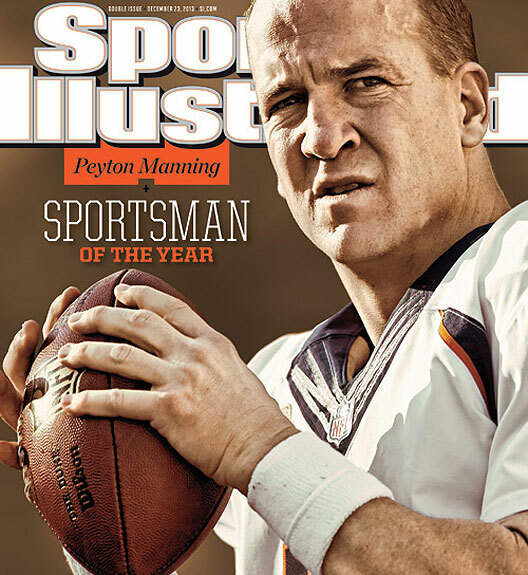 As a Tennesseean, I’ve watched and respected Peyton Manning since 1994. 1) What are you fighting for? Whoa! When’s the last time you asked yourself that? If your immediate, internal answer includes the word ‘my’ then take a closer look. Heroes are fighting for a cause; a big picture, life changing, thing. If you’re fighting for something as small as your comfort or your rights, you probably don’t feel very heroic. I know that when I am just focused on my needs I get miserable pretty quick. I often have to remind myself that I am trying to fight for my wife and our marriage, my childrens’ future as productive and caring adults, and the future of my company which provides jobs to thousands of people. You? 2) Who are your enemies? If you’re a soldier or athlete, that can be a simple question…the other guys. For the rest of us, who are we fighting? When my ‘rights’ to sleep in, sit on the couch and watch football, or do what I want to do are trampled on, it’s easy for me to think that my enemies live right under my roof! That can cause some colossal and frustrating fights. When I realize that my main enemy is most likely me and my sense of self-entitlement, I have an internal battle to focus on. 3) How do you fight? Heroes control their emotions and my biggest fight can be to react to what I perceive as battles with love. That frustrating co-worker? They’re going through a tough time at home. If I jump all over them in an argument, I haven’t gained a friend, I’ve created an enemy. The same goes with my family. My son who’s feeling inadequate to do a school project needs love, not a drill sergeant…even if my tendency is drill sergeant. When you feel like a traitor to yourself or others, assess the situation and answer these questions. In fact, just one question might set you on the path to some pretty heroic actions. Which question would that be for you? I recently finished reading The Steel Wave by Jeff Shaara. It’s historical fiction based on the D-Day landings and subsequent battles in northwest France. The book led me to think a little more about Heroes. 1) Heroes aren’t usually on the side with all of the firepower. 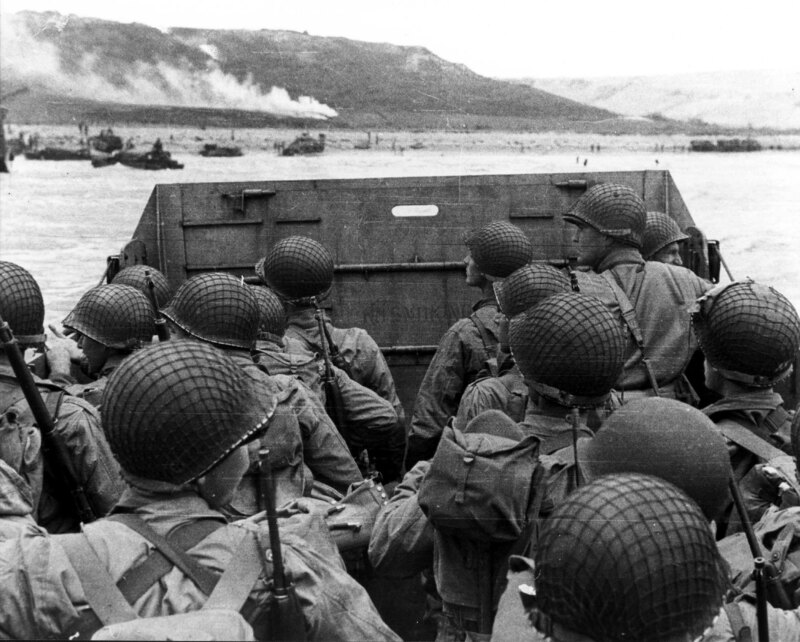 When the 1st and 29th Divisions landed at Omaha Beach on 6 June 1944, those men were given the immediate choice of heroism (up the cliff) or cowardice (stay huddled at the bottom). It’s hard to be heroic when you’re expected to win. However when you are evenly matched or especially an underdog, conditions are ripe for heroism. 3) Heroes don’t gain that status by the use of brute force. When presented with a strong enemy position, the airborne troops who landed in the early hours of D-Day couldn’t succeed with a direct frontal assault. They had to look for soft spots in the enemy line or try to get around the end of the enemy positions. Throwing yourself in front of any problem…be it a tank or a cranky infant is just a good way to get rolled over (or puked on). “So what?”, you might say. I’m not fighting a war or even eating bad food. Well, are you in a position at work where a decision has the support of management but you know that the results could be disastrous? How about in your town…are you helping those around you who don’t have adequate food or clothing…or maybe just need a friend? Is your status at home (as a spouse or parent) based on the power you have to get your way or on the work you do to help others? If you’re in any of those situations, I think the conditions are right for YOU to be a hero. So how heroic do you feel? Is there someone around you that you can be a hero to today? A recent business trip gave me the opportunity to watch a couple of movies I’ve wanted to see for a while. 42 is the story of how Jackie Robinson integrated Major League Baseball in 1947. I followed that up with Captain America, a comic-book adaptation about how an ‘average guy’ became a superhero during the Second World War. As I watched these two films, one based on reality and the other based on fantasy, I thought a lot about what it means to be a hero. 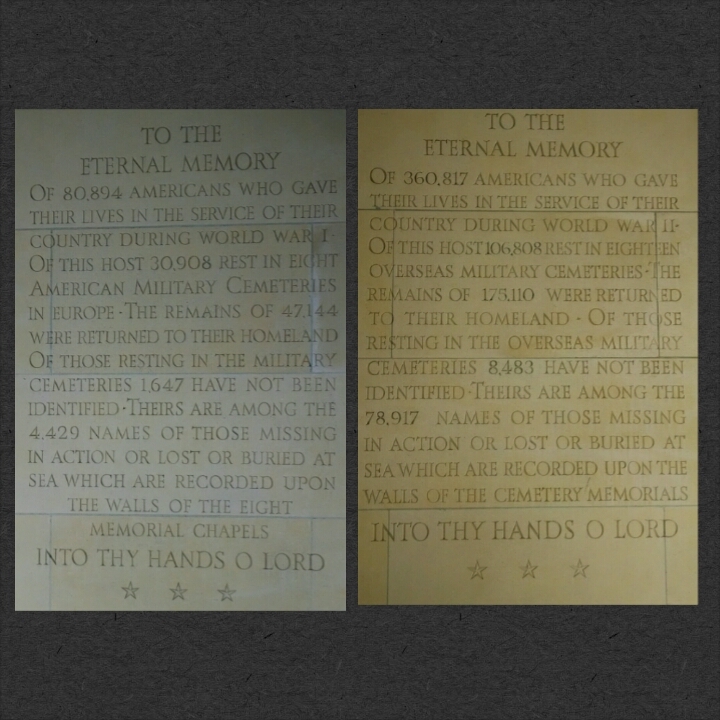 I was reminded of some real heroes in my family tree. For example, my grandfather Frank landed at Utah Beach in the first 5 minutes of D-Day. My ‘grandfathers-in-law’ Bob and Bill were injured during the WWII Italy and Normandy campaigns respectively. These men kept the heroic things they had done and seen mostly to themselves because ‘it was what we had to do.’ They were ordinary people who did extraordinary things. With that in mind, I’d like to give you three things that I think help define heroes…those who get a movie and those who just deserve one. 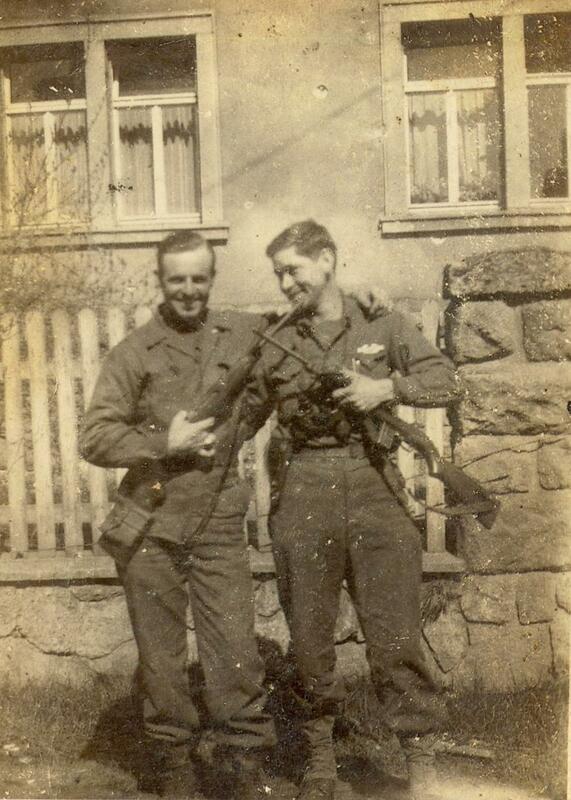 John Richardson (left) and Frank Fields were members of the 4th Infantry Division / 8th Regiment Company G. This picture is believed to have been taken in Germany in 1945. 3) Heroes control their emotions. Bad things happen to all of us but what determines how we respond? Planes strike the World Trade Center and New York’s first responders head toward the disaster, not away…even though all logic plus the fear they were feeling told them to run the other way. Thousands of soldiers boarded boats to cross the English Channel so they could run toward the well-armed strongholds where the Nazis had built modern day castles in expectation of an invasion. Heroes are able to do the exact opposite of what their emotions tell them to do. Do any of these characteristics of heroes resonate for you? If so, who have you seen them in?